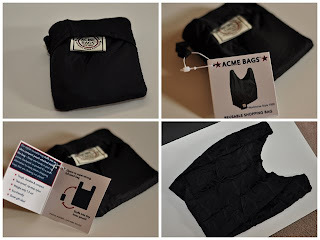 For one-stop reusable bag shopping convenience, consider ACME Bags™ – Reusable Shopping Bag Sampler Set from Reusablebags.com. What does the sampler set include? You can fold the Workhorse inside a pouch, which is attached to the bag, so there’s no way to lose the pouch. Unfolded, it’s the same size as your regular plastic bag. Happily, it doesn’t tear as easily as plastic bags. One Workhorse carried one plastic bag’s worth of groceries when we used it. Now the bags (we have two) are in our glove compartment, so it’s handy. Of the three bags in this sampler set, this is my favorite. I love the neutral color. The bag looks and feels sturdy. It even lives up to its appearance. I don’t know what else to say, except that I love this bag. I’ve got to confess, I’m not a big fan of reusable tote bags. I’m not a tall person, so carrying a tote bag can be a bit of a problem. I’d like to carry it over my shoulder, but sometimes, the bag itself is too heavy for me that I’d want to carry it by hand. Maybe I’m the only one with such a dilemma, but there you go. Happily, the ACME Lightweight Hemp Tote Bag actually has two sets of handles – one set short and one set long. Now I can carry it by hand or over my shoulder, no problem. So maybe I’m not the only one with such a problem, after all. What’s great about these bags? Keeping them clean is easy. Just load them in your washing machine, wash it with cold water, and then drip dry. When I brought all three bags with me when I went shopping, I put the Workhorse and the Hemp Tote Bag inside the Earth Tote. When you need to put stuff in, you’ve got enough bags to pack the items in! It’s a good thing Reusablebags.com came up with this sampler set. Keep up the good work!